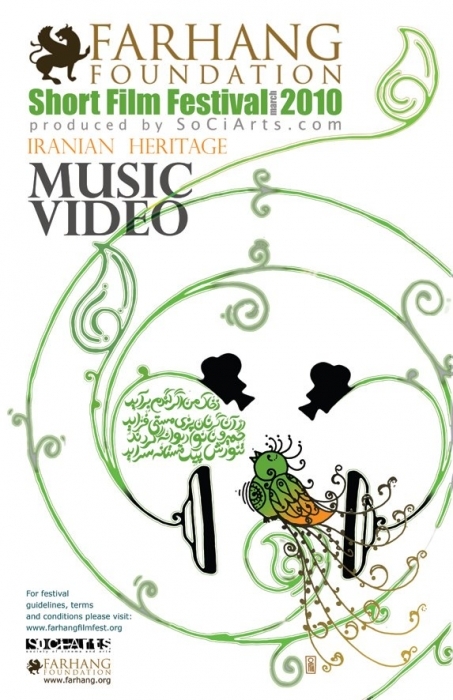 Visualizing an aspect of Iranian arts, history, culture, crafts, geography, cuisine, or lifestyle through music videos. The goal of the festival is to inspire and spark the audience's interest in learning more about Iranian art, history, and culture. Watch the top 9 videos. Watch all of the Submitted Videos Here. Farhang Foundation and SoCiArts are proud to announce the second annual Farhang Foundation Short Film Festival. This year, filmmakers and musicians from all walks of life, Iranian and non-Iranian, are invited to create a music video of any genre or style, visualizing an aspect of Iranian arts, history, culture, crafts, geography, cuisine or lifestyle. Farhang Foundation will be looking for music videos that inspire and spark the audience's interest in learning more about Iranian art, history and culture. Videos should be(lless than 9 minutes, of any genre or style, visualizing an aspect of Iranian arts, history, culture, crafts, geography, cuisine or lifestyle. All entries will be judged for creativity, quality, and originality. NOTE: This is an internet based film festival and competition. All videos will be available for the public once they are uploaded to the site. All submitted films have been judged by the festival’s jury committee based on the film’s artistic merits only. Views expressed by the filmmakers do not represent those of the Farhang Foundation or its Board Members and Management. Click HERE to see "Haftan" the 2009 Prize Winner. Farhang Foundation is a non-religious, non-political and not-for-profit foundation established in 2008 to celebrate the art and culture of Iranian-Americans in its widest extent. The foundation supports academic activities in Southern California by funding university programs, publications and conferences. The foundation also supports cultural programs such as celebration of Noruz and Mehregan, Iranian plays, dance performances, films screenings and poetry reading in Southern California. Farhang Foundation, n cooperation with various cultural and academic institutions plans major programs and exhibitions about Iran and its culture. To support the study and research of Iranian history, art and culture in all its rich diversity in cooperation with academic and cultural institutions. Farhang works on promoting and celebrating the culture and heritage of Iranian-Americans, thereby enriching the community at large in Southern California.